Above: Sen. Tom Briese and wife Joan love spending time with their family — including grandson Jaxson — on their farm outside of Albion. For a farm kid from Albion, even the promise of a lucrative law career could not deter Sen. Tom Briese from a life working the land. 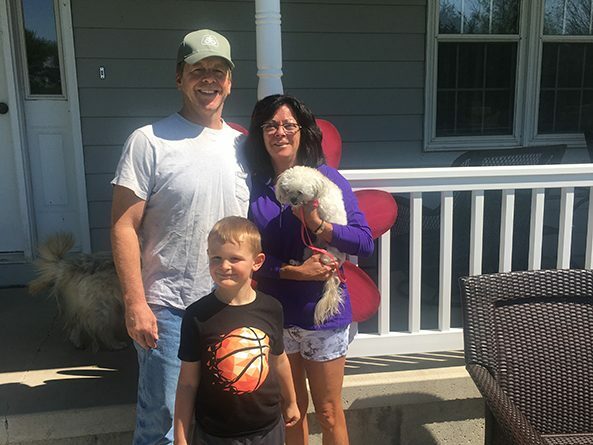 Following high school graduation, Briese had moved to Lincoln to earn his degree in agricultural economics from the University of Nebraska-Lincoln. He earned his law degree from UNL three years later, clerking for a federal judge and practicing law, before returning to his first love. “Once agriculture gets in your blood, it never disappears,” Briese said. He returned home to the Boone County family farm and never looked back. Briese — a fourth-generation farmer — and his wife Joan continue their family’s agricultural tradition, growing corn and soybeans outside of Albion. Being outdoors with his wife, two children — son Adam and daughter Ashley — their spouses and his two grandsons is where Briese is happiest. Besides farming, he loves to hunt and fish. Golfing is another favorite past time, but he admits he will never be confused for a professional. “I have fun, that’s all that matters,” he laughed. Briese’s interest in running for office began in high school, when he regularly kept up with the legislative action in Lincoln. He has been active in his community for years, including serving on the Boone County Farm Service Agency Committee and the Boone Central School Board. After decades of farming and raising his family, he finally felt that the time was right to make good on his teenage ambitions and run for a seat in the Legislature. The daily life of a state senator can be hectic, but he welcomes the opportunity to listen and learn. Briese said he is here to represent his constituents and understands the great importance of having an open mind. Despite his full legislative schedule, he continues to stay engaged in civic organizations that are important to him, like the Boone County Foundation Fund and Boone County Philanthropy Council. Briese is busy wrapping up his first session in the Legislature, but true to form, he already is looking ahead. He says he has made progress on some issues this year, but is working on future legislation to address concerns brought to him by constituents, including property tax relief.